All the books mentioned below are books I own. However, I was unable to find them all ... we had a basement flood a couple months ago and our books are kind of higgledy-piggledy around the house. Just imagine what a great photo shoot it would have been had I been able to find all the books mentioned! My favorite thing this week is food writers. I think it's a bold decision to write a book about food--and I don't mean to write a cookbook. I mean to get into the business and write about your experiences. Or to write about the business you've already been a part of. To write well about food, you need to be factual and honest and motivated. You can't just write to write. There's nothing I dislike more than opening a book and seeing an ulterior motive. Of course, all books have an ulterior motive (to get you to read them), but I want to see the author grow from their experience. I don't want to read about Janey's culinary school experience when Janey just got out of the Community College Cooking School. I want to read from an established food writer, someone who is writing to spread a message and to teach the readers something. And that's exactly what my favorite food writers do. All are established in the food world, or consult people who are. All admit weakness, fault, ignorance, but are unafraid to admit it and forge forward anyway. Below is a short list of some of my favorite food books--I hope that, if you're interested in the food business at all, you'll give at least one of them a try. I also learned that if I ever want to release a book, it will have to have an insanely long and descriptive subtitle. No one-word-title books for me. had an overzealous toddler armed with a marker. The Making of a Chef: Mastering Heat at the Culinary Institute of America, by Michael Ruhlman: Michael Ruhlman is one of my very favorite food authors (the link to his blog is on the left side of this page.) He's well-spoken and well-written. The Making of a Chef is a great introduction to what cooking can be. Ruhlman enrolled at the Culinary Institute of America with the intent of writing about his experiences, but the book goes far beyond that. If you're curious about what the very best culinary school in America is like, I highly recommend this book. Also, I had a dream last night and he was in it ... weird. The Man Who Ate Everything, by Jeffrey Steingarten: If you're a watcher of Iron Chef America, you'll know who my first two authors are right away. Jeffrey is often the frank, "Simon-esque" judge of the show and is not afraid to tell world-famous chefs that he hates their food. But you know what? If anyone has that right, it should be Jeffrey. He documents his immersion into food in both this book and its sequel (It Must Have Been Something I Ate). Steingarten's writing is funny and light yet still highly educational and readable. If you read any book about food this year, one of Steingarten's books should be it. The Story of Sushi: An Unlikely Saga of Raw Fish and Rice, by Trevor Corson (also released under the title The Zen of Fish: The Story of Sushi, From Samurai to Supermarket): I picked this book up at Barnes and Noble while looking for something to read. I wasn't sure what to expect. The Story of Sushi follows a student named Kate as she makes her way through a sushi school to become a sushi chef. Kate's story is interspersed with factual information about sushi--its history, facts about the various fish used for sushi, as well as facts the typical sushi eater would find useful, like sushi etiquette. Although Kate is sometimes an annoying subject (her unwillingness to try new things or to perform basic tasks, such as sharpening her knife), she also has redeeming qualities and is the kind of person I think many readers can relate to. Corson's first book, The Secret Life of Lobsters: How Fishermen and Scientists are Unraveling the Mysteries of Our Favorite Crustacean, is less grabby but no less informative. Garlic and Sapphires: The Secret Life of a Critic in Disguise, by Ruth Reichl: I love how Ruth Reichl (the editor of my favorite food magazine, Gourmet) writes. It's descriptive yet incredibly easy to read. And she's unafraid to show her fears and flaws. Garlic and Sapphires covers her stint as a food critic for the New York Times. To avoid being recognized and with the desire to review each restaurant as a normal person would experience it, Reichl adopts several disguises. Each disguise seems to have its own personality. This is a fabulous and funny introduction to the world of fine food. and haven't gotten them back yet. Kitchen Confidential: Adventures in the Culinary Underbelly, by Anthony Bordain: What kind of list would this be without Kitchen Confidential aboard? Anthony Bordain's first book is a tell-all into the unseen world of restaurants (although he admits, in his more recent release, Medium Raw: A Bloody Valentine to the World of Food and the People Who Cook, that it was mainly just a bit of angry, "let's out everyone" writing that he didn't think people would actually take seriously.) Bordain is not afraid to let loose, and I don't think anyone would be able to hold him back anyway. Tony is the raw, angry dissenter to the food world who everyone loves to hate. Food Inc.: A Participant Guide: How Industrial Food is Making Us Sicker, Fatter, and Poorer--And What You Can Do About It: Had lots of good information--but honestly, I felt like I couldn't win. Do I become a vegetarian? Oh no, that would be the downfall of the meat industry. But the meat industry is evil! But if we don't eat meat, what will the farmers do? Sigh. Under the Table: Saucy Tales from Culinary School, by Katherine Darling: I actually returned this book. I rarely ever do that. But this book was flat and hokey. I felt like she went to culinary school just so she could write about how hard it was for a woman, not about wanting to work in the industry afterward. If you want to read about culinary school, there are much better books out there. Julie and Julia: My Year of Cooking Dangerously, by Julie Powell: Wow. What a whiner. I disliked her husband, too. Her writing is humerous but I just couldn't sympathize with her. I wish I could watch the movie with Meryl Streep's portrayal of Julie Child only, and leave the part with Julie Powell out of it (seriously, the scene where she makes the chocolate cake and her husband rips it apart with his bare hands?) And I'm completely uninterested in reading her newest book, Cleaving, which just seems like a setup. I honestly wouldn't be surprised if she cheated on her husband just for the opportunity to write about it and hang onto her 10 seconds of Julie and Julia fame. 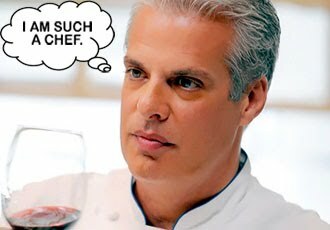 Eric Ripert. See what I mean? The Art of Eating, by M.F.K. Fisher: M.F.K. Fisher has been said to be the goddess of food writing. I just need to find one of her books actually in print. I hope this short compilation has given you an idea of your next read! Food can be interesting, inspiring, and informative, and even people not interested in learning about food would find many of these titles fun reads. If you've got a favorite book on food that didn't make the list, write about it in the comments! I'm always looking for something new to read. Here are a few more suggestions for your calendar. David Rocco, Rocco deSprito, Sam Talbot (Top Chef), Michael Chiarello, and Marcus Samuelsson.